While increasing agricultural productivity is a key strategy to meet the ever-growing global demand, modern and high input agriculture is at the center of public debate in many developed countries. Modern production technologies are often criticized for their alleged negative impacts. This is also the case for the production of poultry meat in the EU and Germany, which is in the focus of this study. The markets for poultry production have grown rapidly in recent years. 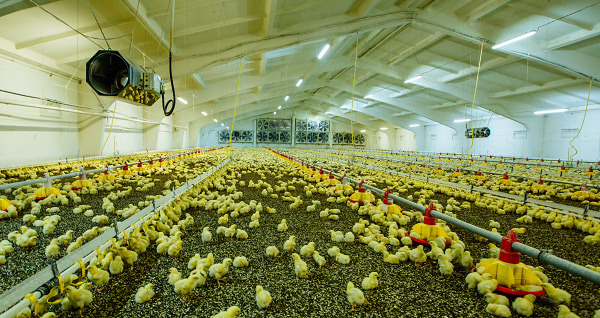 At the same time, poultry production has also often been criticized as being “industrialized” and for having negative impacts on the environment. In this HFFA Research Paper, the authors Harald von Witzke (Humbodt Forum for Food and Agriculture e.V. ), Hans-Wilhelm Windhorst (Wissenschafts- und Innovationszentrum Nachhaltige Geflügelwirtschaft) and Steffen Noleppa (HFFA Research) attempt to comprehensively assess the social benefits of modern livestock production. 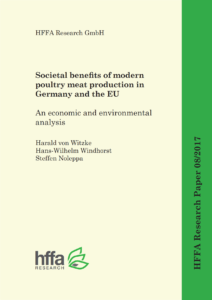 Their analysis is so far the first to quantify the societal benefits of poultry meat production in Germany and the EU. More specifically, the study calculates the potential costs of switching from highly intensive poultry meat production to scenarios in which this production is replaced by two alternative production systems: extensive and organic poultry production. As the analysis highlights, these “alternative” production forms are less efficient in terms of productivity as they use more resources than the highly intensified poultry production. While the extensive production method raises production costs by 25 to 30 percent, organic production is found to increase these costs by over 100 percent. As a result of the aforementioned higher production costs, the prices for poultry meat and related goods would increase domestically. Declining domestic production that is caused by a shift towards more extensive and organic production methods would also increase the incentives for additional poultry production abroad. This would almost inevitably lead to the conversion of agricultural land, coupled with high CO2 emissions and a potentially large loss in biodiversity. Hence, overall, the authors conclude that from an economic welfare perspective, intensive poultry meat production is of high societal value to Germany and the EU, when compared to the organic and extensive scenarios. Globally, a switch to organic or extensive production would negatively impact world food security, because production would decrease, having a negative impact on the downstream value chain.